I came across some old Daily Racing Forms in my office recently and couldn't help but get a little nostalgic about horse racing's “good old days.” Not the 1940s or '50s, but what I consider modern (and pretty good) times: the late 1980s, when I had been working at the Form's Los Angeles office and decided to accept an offer from Thoroughbred Times and move to Lexington, Ky.
Daily Racing Form truly was “America's Turf Authority” then. It was the sport's only record-keeper, charting races and compiling attendance and handle figures from every recognized racetrack in the United States and Canada. But Walter Annenberg, the Form's longtime owner and considered a close ally of horse racing, in 1988 sold the paper's parent company to Rupert Murdoch's News Corp., a move that worried The Jockey Club and member tracks of the Thoroughbred Racing Associations. Shortly thereafter, those two organizations established Equibase, which gave ownership of the sport's data to an industry-owned company. Daily Racing Form (which has changed hands several times since Murdoch bought it in 1988) lost its monopoly on past performances and was no longer horse racing's de facto record-keeper. 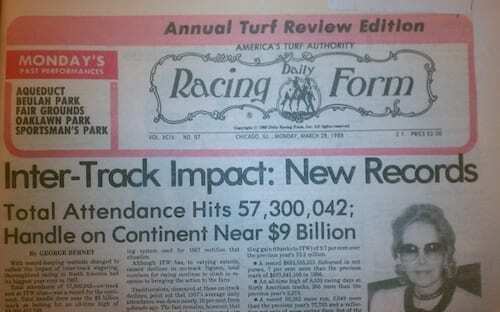 This particular 1988 Racing Form edition I was looking at was called the “Annual Turf Review”, which published comprehensive statistical information on the previous racing year. The paper's front-page headline was: Inter-Track Impact: New Records–Total Attendance Hits 57,300,042; Handle on Continent Near $9 Billion. It was a business snapshot of a time when horse racing was transitioning into the era of simulcasting, or inter-track wagering as it was then called. There were no casinos outside of Nevada and Atlantic City, N.J., and horse racing didn't have the competition then that it does today. A little booklet published by the Form in the late 1980s proclaimed horse racing the No. 1 spectator sport in America by total attendance. Today, most tracks don't even release attendance figures. I wondered how the statistics in this “Annual Turf Review” from the 1987 racing year stood up to those from 2012 – a 25-year comparison. Equibase publishes a bare-bones monthly and annual review showing aggregate wagering, purses, and racing days from U.S. tracks. Here's what I learned comparing 1987 to 2012. —The 1987 U.S. handle of $8.2 billion was derived from 7,667 racing days. That's an average handle of just over $1 million per race day. Adjusted for inflation, $8.2 billion in total handle would be $16.6 billion in 2012 dollars and the daily average of $1 million would be the equivalent of $2.2 million today. —The 2012 U.S handle of $10.9 billion was derived from 5,310 racing days, an average of $2 million in daily wagering. So even though total handle has fallen far short of the inflation-adjusted mark of $16.6 billion, a 31% decline in race days kept average wagering per day down only 9% of what it was in 1988 dollars ($2 million vs. $2.2 million). —Purses totaled $650.6 million in 1987, an average of $84,860 per day. Those same dollars would be worth about $1.3 billion today, or $171,975 per race day. —In 2012, purses stood at $1.1 billion. Average daily purses are $211,725 per race day. —In 1987, $1 in purse revenue was generated by $12.60 in wagers. That means 7.9% of each dollar wagered went into purses. —If we applied that same formula to 2012 ($10.9 billion in wagers x 7.9%) purses would be $863 million, suggesting a minimum of $261 million in purses were generated by alternate gaming such as VLTs, slots, or racetrack casinos. That $261 million in gaming subsidies is probably a conservative number. In 1987, most wagering was still conducted on-track and the takeout was divided pretty evenly between purses and racetracks. In 2012, betting dollars are divided up more ways, with ADW companies getting an increasingly bigger share of the pie, leaving less for tracks and horsemen. This is not a healthy trend, especially if you believe an increasing number of states is going to reduce or eliminate horse racing's current share of alternate gaming revenue. This entry was posted in Ray's Paddock and tagged daily racing form, Horse Racing, horse racing trends, thoroughbred by Ray Paulick. Bookmark the permalink.